Your on-the-job duties don’t take a break simply because of relentless weather conditions. 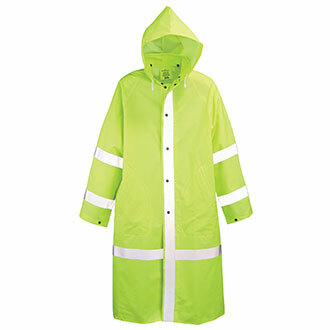 Pull on the Neese Lime Green 48” PVC Vinyl Raincoat with Reflective Striping to stay dry when you are on patrol on less-than-ideal wet days. No matter if the sky is providing drizzle or a downpour, you’ll stay dry underneath this rain coat thanks to its waterproof construction featuring seams that are sealed. Manufactured of a high-quality PVC vinyl, this Neese Lime Green Rain Jacket not only provides adequate protection from rainy weather, but also ensures you don’t go unseen. Its bright lime green color is coupled with a highly-reflective striping, so you stay visible during both daylight and nighttime hours. Make your line of duty clear by choosing between a variety of titles that can be included on the back of the jacket. Police raincoats in plain back are also available. Ensure your comfort and safety while on the clock in adverse conditions by purchasing your own raincoat today! I've had many times where I needed a longer raincoat than the one provided by my company. This raincoat fills the bill by being longer and keeping me visible in low light conditions. The price is also a plus!